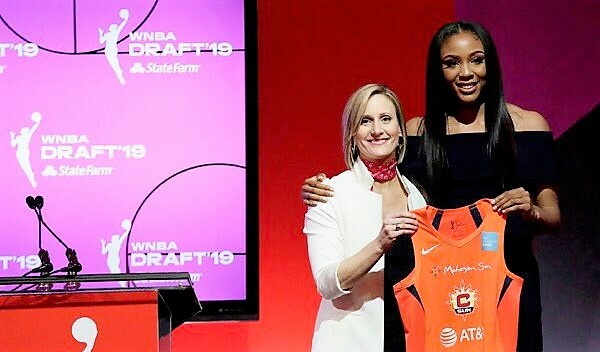 Former Desert Vista standout Kristine Anigwe was the ninth pick in the WBNA Draft (Connecticut Sun) held on April 10. The first-round selection scored 1,545 career points at Desert Vista from 2012 to 2015 before moving on to play for Cal where she earned Pac-12 Freshman of the Year honors. Anigwe (6-4) was the Arizona Player of the Year after she led Desert Vista to a state championship. Anigwe was the 2019 Naismith Defensive Player of the Year and the Pac-12 Defensive Player of the Year, she led the nation in rebounding with 16.2 rebounds per game. The first four-time All-American in Cal history, Anigwe pulled down 533 rebounds as a senior, the highest single-season rebounding total ever by a Pac-12 player. The 6-foor-4 center was the first Division I women’s player in 30 years to average over 22 points and 16 rebounds per game with totals of 22.3 points and 16.2 rebounds per game this season. She is Cal’s all-time leader in career points (2,591), rebounds (1,404) and blocks (205).